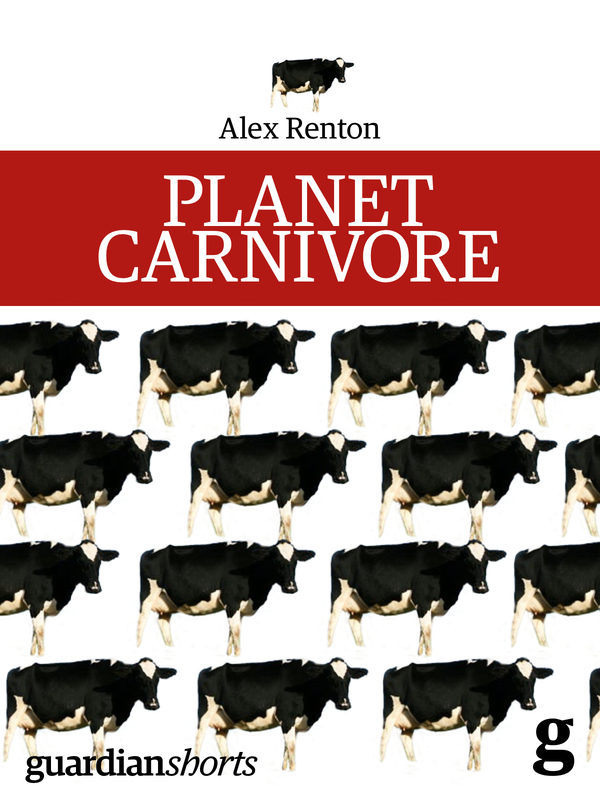 When his six-year-old daughter, Lulu wrote a letter to God, Alex Renton did his best to get her an answer — with a little help from the Archbishop of Canterbury. 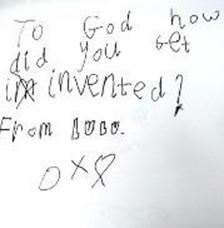 M y daughter came home from primary school a few weeks ago and sat down to write a letter to God. It read “To God how did you get invented? From Lulu xo ” When she asked us to send it (by setting light to it and putting it up the chimney, as we do with letters to Father Christmas) several courses of action offered themselves. Easiest of all, for us, would have been to fold the piece of paper and file it in the memory box — Lulu is 6 and hasn’t written more than a dozen letters in her life. Then we would have sat down and told her that God couldn’t be sent her letter or answer the question because, in our view, he didn’t exist. We would have said that he was invented by human beings, because they were rather puzzled by life and death and some other problems in between. But that wouldn’t do. We (my wife and I, though I’m now going to stop speaking for her) try first to be honest with our children, but to follow that good principle here seemed self-indulgent. Selfish, in fact. In any case, the commitment to myth-busting in our house is already shaky — as shown by the Santa Claus rituals, not to mention occasional worship of the Tooth Fairy and that hideous Easter Bunny. I know people who don’t do Christmas and have stripped their children of the trammels of stockings and carols. But I can’t see the point. For one thing, you’re more likely to grow a teenager who embraces myths and cults, in reaction to rigid parental rationalism. Imagine the stories they’d tell about you to their friends. More important, the desire to shield your children from delusion and falsehood is easily matched by the one that longs to protect their innocence, to let them learn about the world at a gentle pace and, indeed, learn for themselves, rather than always hand over your notion of what is what. Quite simply, I didn’t want to tell Lulu there was no God, and I could not tell her there was. Not that that was the end of things to hum and ha about. Lulu’s new interest in the supernatural was eminently natural, of course, and welcome. Less comfortable was how much it was fuelled by her new school, not as an area of inquiry, but as a fact. Ridiculously ill-informed, we had no idea until last August that a state primary affiliated with a church would do quite so much God. I like the idea of my child learning about the faiths and especially Christianity: it is the foundation of much that is lovely and important in our culture. I’m not revolted by the Bible’s “sinister fairytales” as are some of the angry atheists of our times; though I, like Christopher Hitchens, did go at eight years old to the sort of boarding school where the book was used by the hypocrites and creeps who ran the place to arm themselves. That wasn’t much of an advert. The Bible, taken highly selectively, is of course a pretty good introduction to the humanist moral system in which I’d like to see my children play a part. I have a copy of A. C. Grayling’s new “secular bible”: a wonderful enterprise, but it lacks the songs and the stories. No child should be denied Samson and Delilah. Or indeed Jael, the assassin and freedom fighter, with her lordly dish of butter and her sharpened tent peg. I was happy that the Bible should have a role in Primary 1, but not at all that religious credo and worldly truths should be taught to my daughter as the same thing. Her adored, excellent teachers — thanks to whom she now writes letters — were giving out indubitable information (two and two equals four) with the same weight as the highly dubious (God loves you). Within a few weeks of school starting last August we found her praying at bedtime. That was rather sweet, on first sight, but then I thought: shouldn’t we have been asked? I felt that the evening ritual of teeth-brushing, story, song and kiss — the most intimate between child and parent — had been rather invaded. And while teaching the habit of praying to God to help one be good is hardly corrosive to the liberties of a six-year-old, I felt already that her moral education had been taken out of our hands and off on to controversial ground. In a small way, I felt she had been insulted. My clever, kind girl didn’t need some unexplained superbeing’s help to be good, nor should she so lightly be invited to pass over the responsibility. Deep in my gut, I disliked the fact that others were interfering with the mechanisms of her naturally emerging conscience. Offering her the consolations and excuses of religion was one thing, but what when they started with the threats? No child in my charge should have to make moral choices based on the fear of a god’s displeasure, or indeed of the fires of Hell. And there was a further problem. My sister and her daughter, almost Lulu’s age, died in an accident last year. A beloved aunt went a few months before. While these awful things made no difference to my (lack of) religion — they did throw up the simple question: What do you tell the kids? When inevitably I was asked “Are they in Heaven?” I muttered something like “Lots of people are sure they are in Heaven: they’re in my heart.” I’m not proud of that, though I know I could have stepped up and lied if the full assurance had been required. Under the dubious moral code of my childhood, that would have been OK: a “white lie” to ease suffering. But when, a few months after that disaster, she came back from school announcing that her grandmother’s recently deceased dog was in Heaven being looked after by St Francis of Assisi, I began to grow tired of nodding along. So when she asked God how he was invented, I cheered my little nascent rationalist. Only one step now to asking who invented God. And: why? But that isn’t a small step. And then I thought: this isn’t my problem. There are people who believe in God who ought to be able to answer a fellow believer’s question. Some of them are paid to do it. Lulu’s letter is of their making, not mine. If they could satisfy her, I would keep out of it. For the time being. First, I e-mailed her letter to both her grandmothers, and to some friends who are active Christians,. The responses were interesting, and Lulu listened to them patiently. The grandmothers did best, perhaps because they’d faced these questions before. Both said that God did not have to be invented because He was always there, even for people who didn’t feel they needed Him. That He wasn’t actually a person, but “the power of love”. It took courage to have faith in Him, said one. My Christian friends were less useful, but then they were the wrong people to ask. Of course they had had no trouble giving their children answers when the What is God? question emerged (usually at about six or seven years old). What if they were me? I wondered. One said he had no idea how he would deal with the letter as me, but why not ask an expert? He suggested Rowan Williams, whose writings on faith he admires. So I sought the views of some of the professionals. After a bit of googling, I e-mailed a Jpeg of Lulu’s letter and a brief explanation to the Episcopalian Church in Scotland, where we live, to the Church of Scotland and to the Scottish Catholic Church. I did not mention my own views. For good measure, I sent it also to the head of theology of the Anglican Communion, based at Lambeth Palace. I heard first from Monsignor Paul Conroy, of the Catholic Bishops’ Conference of Scotland. He wrote this: “My reply would be along the lines of ‘God is like us — he wasn’t invented — but unlike us he has always been there. God is like someone we’ve always loved — we don’t remember when he came into our lives because like the people we love who have been there all our lives it’s as if we can’t imagine what it would be like without him’.” It seemed theologically on the button, but not much tailored to the six-year-old mind. The Episcopalians and the Presbyterians didn’t reply. Lambeth Palace waited a couple of weeks and then asked me to tell Lulu that someone special was going to write to her. Eventually there came an e-mail from “Archbishop Rowan” (Lambeth Palace gave permission for the letter’s reproduction here). I was touched, more than I would have imagined. My scepticism about religion, and my cynicism about the Anglican Church, didn’t dissolve — how could they? But these things were quite easily put to the side in the face of the Archbishop’s kindness and wisdom. “Well done, Rowan!” declared my mother when I forwarded the e-mail to her. I agreed. Respect to the Archbishop, a charming, gentle man and a poet. I found photos of him on the internet and showed them to Lulu. She rather liked the beard. I explained a little of who he was and what he did and stood for (that would have been harder if we’d had a letter from the Pope). She listened quietly as I read the Archbishop’s letter and it went down well. What worked particularly was the idea of “God’s story”.